Father Tikhon, why is Pascha celebrated each time not as the anniversary of the Resurrection of Christ but as the Resurrection itself? —The Apostle Paul made an astonishing revelation about two thousand years ago. He said, Jesus Christ the same yesterday, and today, and for ever (Heb. 13:8). Christians feel the great power of these words, if their faith is not just matter of tradition but rather a living faith; if they also feel and live their communion with God as the most important reality of their lives. This relates also to the Resurrection. Unfortunately (or perhaps fortunately) it is impossible to convey this through mere theoretical postulates. This is just how God has ordained it. If faith were no more than a theory, Christ’s Church would have withered only a few years after it began. After all, our faith is something different, it is like a living connection between God and His people, between God Who became man—Jesus Christ, and each one of us Christians. The living feeling of the pulse of eternity, which responds in every Christian, is especially felt on the feast of Pascha, the Resurrection. Little children are aware until they grow up that death is something completely foreign, incomprehensible, and unnatural to man. We adults remember well this perception of the realty of eternity in our childhood as one of the constants of existence of a person only recently come into the world. But even in adulthood, and even at the end of one’s life, a sense of the absurdity of his own death never leaves him up to the last minutes. Every doctor and every priest can testify to this.This is by no means some sort of psychological phenomenon or self-deception. It is an astonishing reality that is open to a person.The Resurrection of Christ tells us that we are not mistaken: There is no death for a human soul, for a human personality. The revelation of the life of the age to come, the kingdom that is not of this world, and the invitation to it is the very essence of the Gospel, the main significance of the Resurrection, and the essence of the matter of Jesus Christ in the human race. —But what do we need to do, so that we can learn to celebrate the Resurrection like that—as a present, real event? After all, many people know the rule—how to bless the kulich (Easter cakes), how many times to kiss in the Paschal greeting, how to cross yourself… But perhaps we are missing the most important thing? —Yes, every person will have to figure that out for himself. There is no other way. Christ only patiently, with unfathomable love invites every person. However, He never violates our freedom. 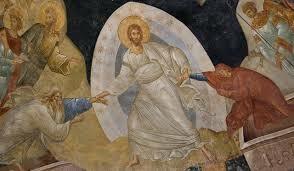 This is the main question and revelation of Pascha. This is the most important thing. But what color to dye the eggs, how to bake kulich—believe me, that is the 1025th priority. —So what should one do to come to terms with this—read, pray, talk to a priest? —During the Lenten services in the churches we often recall the ancient lines from the Bible, “Seek God, and thy soul shall live.” Of course, we must first seek answers to the most important questions in church with the priest. Some will say that not every priest is able to answer accessibly and clearly. Well, I suppose in that case you need to go find one who can. For some a believing friend may be a helper in this important matter. For others, it may be a book. There is no ready recipe for this. —Can any spiritual father be chosen for such talks, in the hope that God will send the right one, or does it make sense to look around? —A spiritual father should not be an indulger, as they used to say in Ancient Russia. That is, he should not indulge your sins. He should without fail be kind and merciful, but out of love for you he should be exacting; he should lead you to Christ according to the law of the Gospel, and not according to the law that you yourself dictate to him. This is a principle question. It is the same as choosing a doctor. You can come to an agreement with your doctor and he will make any number of concessions for you—but they will be your ruin. On the other hand, you can seek and find a doctor who will heal you. —Are the Paschal feasts a good time to make that important step to the church? —To those who have not yet made the church their home I would like to wish that they might feel and see how beautiful, good, and amazingly bright life in Christ’s Church is, and how much of the future is prepared for them in it. I am deeply convinced that a spiritual father must be sought. You have to pray, and search again. It does not make sense to approach the first priest you meet and say: Be my spiritual father. You have to get acquainted with him, go to confession with him, and see how well he can answer the question specific to you. Get to know another, then a third, and only then make your decision.